While not everyone likes to live vicariously through others, each person would have different reasons for doing this. 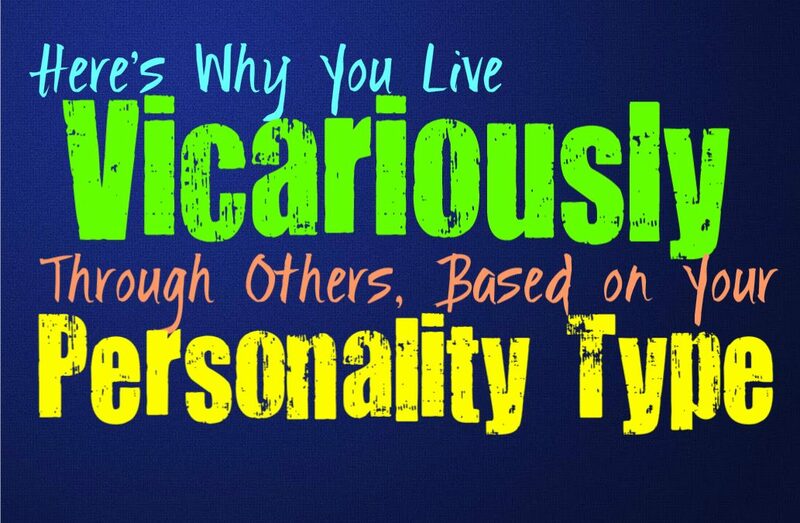 Here is why you like to live vicariously through others, based on your personality type. INFJs sometimes live vicariously through the people they love, because it can feel more rewarding. It can be challenging for them to take steps forward sometimes, and they might be afraid of taking too many risks. The INFJ who feels this way will want to support their loved ones, and can sometimes live vicariously through their experiences. This can also occur because INFJs have such rich inner minds and imaginations, that they can share in those experiences and this feels almost firsthand to them at times. They are also great at helping others and often know how to give them advice in order to improve their lives and be happy. ENFJs who tend to live vicariously through others, do this because they don’t want to take too many risks themselves. ENFJs do everything for the people they love and work hard to make them happy. They can sometimes push aside their own needs and desires in order to make sure that the people around them are taken care of. This desire to provide for others can cause the ENFJ to forgo their own wants, and they will begin to live vicariously through those around them. Seeking to constantly improve the lives of others, and not truly experiencing as much themselves. INFPs don’t often enjoy living vicariously through others, but if they do it often comes from fear of making mistakes. They can sometimes feel a lack of motivation because they don’t want to be a disappointment, and this can be a challenging and immobilizing feeling. When the INFP lives vicariously through someone else, it is often because they are good at being the cheerleader for their loved ones. They show their support and help motivate them to go after their dreams and follow their hearts. This can also happen because INFPs become so caught up inside of their own inner minds, that they don’t actually experience things firsthand. ENFPs don’t usually enjoy living vicariously through others, and prefer to live their own lives. They want to experience things firsthand, and become truly frustrated if they live with a sense of stagnancy. When the ENFP somehow feels incapable of taking those steps or simply does not have the means, then they will have to live their lives vicariously through others. They will use their sense of imagination in order to feel closer to these experiences, egging their friends on in order to motivate them towards some sort of greatness in their lives. INTJs don’t usually like to live vicariously through others, since they prefer to be in control of their own lives. The INTJ who does decide to live vicariously through someone else, will do this in order to take advantage of the learning experience. They might try to help this person make better choices, and are often good at giving perspective and advice in many situations. The INTJ living vicariously through someone likely wants to watch their actions, and try to gauge the best way for them to improve or live more successful lives. ENTJs often prefer to live their own lives rather than live vicariously through someone else. Not being able to take real action and live their lives in a way that is constantly improving and moving towards the future, is certainly going to be frustrating for the ENTJ. If they are in some situation where they feel like they cannot move forward, living through someone else is often used as a learning experience for them. They will want to watch and learn from someone else’s behaviors, seeing if they can help motivate them to make the right choices. INTPs can sometimes live vicariously through others, since they have a hard time motivating themselves to move forward. INTPs are intuitive and intellectual people, who are often excellent at coming up with efficient ways of improving their lives. While they can often see the best path ahead of them, the INTP might struggle to motivate themselves towards this goal. When they feel a bit stuck they might seek to give advice to someone close to them, living vicariously through their actions. The INTP will watch how each plan plays out, wanting to guide their friend or loved one towards the best possible path of success. ENTPs usually choose to live their lives on their own, and possess a strong sense of independence. They rarely find themselves wanting to live through someone else, and would rather make their own choices in life. If the ENTP feels stuck or incapable of moving forward however, they might end up living vicariously through the actions of someone else for a while. This is often a great learning experience for the ENTP, and is used as a way to understand the individual and even themselves better. Living through someone else isn’t the best option for ENTPs though, since it will leave them feeling stagnant and even trapped in their situation. ISTJs don’t often like to live vicariously through others, and would often prefer to live their lives actively. ISTJs work hard to achieve their goals and have a strong sense of responsibility. They often would rather be the ones getting the work done rather than stepping back and allowing others to take care of it. ISTJs who end up having to live through someone else, often feel very frustrated by this. They will strive to get back on their feet, but if they have to live through someone else they will do their best to help them improve themselves and live happy lives. ESTJs don’t like having to live vicariously through others, and would prefer to take care of things themselves. When the ESTJ is stagnant and incapable of moving forward, they might find themselves living vicariously through someone they love and are proud of. They do this because they cannot move forward themselves, and need to be able to inspire someone else in order to improve their lives. ESTJs rarely feel this way though, and are more comfortable taking care of their lives themselves. ISFJs can sometimes live vicariously through others, both out of fear and wanting to help others. ISFJs can focus so much on helping their loved ones that they neglect their own goals and desires. This causes them to focus on their loved ones goals and they can often live vicariously through them. ISFJs can also struggle to take too many personal risks, having a hard time really feeling like it is worth the chance. They don’t want to make mistakes that might upset someone they love, so they can often find themselves living vicariously through others. ESFJs usually prefer to live their lives taking care of things themselves, but that doesn’t mean they don’t sometimes experience things vicariously through someone else. ESFJs can become so focused on taking care of their loved ones that they start to neglect their own personal needs and desires. ESFJs care about others and they focus hard on taking care of them, so much so that they often push aside their own needs. When this happens the ESFJ might actually live through others actions, inspiring their loved ones to go after their dreams instead of doing it themselves. ISTPs don’t like living vicariously through others and would much rather live their own lives. ISTPs live in the present and like being able make their own choices with control of others. They are action based people who don’t often sit back and let others take charge of things. ISTPs rarely find themselves wanting to live vicariously through others, but if they do it is likely because they lack motivation or the means to really experience things their own way. ESTPs are only likely to live vicariously through others when they are feeling bored with their own lives. If they are experiencing a lull in their own lives the ESTP might want to seek out excitement by living vicariously through others. They can enjoy watching them take on new experiences, and will try to feel some excitement this way. ESTPs simply want to be entertained instead of feeling stuck in the same boring position all of the time. ISFPs prefer to live their lives in the present moment and don’t like having to live through others. The only times the ISFP will end up living vicariously through someone else, is when they feel stuck and incapable of actually moving forward. When the ISFP doesn’t have the opportunity to live their life the way they want, they will try to entertain themselves and experience things through someone they care for. ESFPs prefer to live their lives themselves and want to dive into new experiences as much as they can. ESFPs become frustrated and unhappy if they are stuck in the same stagnant situation. The only time the ESFP will want to live vicariously through someone else, is when they don’t have the means to live their own lives or experiences. They will try to motivate someone they love into follow their dreams and actually achieving the things the ESFP hasn’t been able to.